Learn more about quarterly seminars and dialogue programs offered by CSI-Communication and Leadership. Seminars and programs are open to current UC San Diego undergraduate and graduate students. CSI-Communication and Leadership offers non-credit seminars that develop students' leadership, professional, and social skills through fun and interactive activities and discussions.. Beginning week 2 of each quarter, the seminars meet twice a week for eight 90-minute sessions in a cohort-based learning environment. Participants are asked to attend all sessions for optimal learning from the seminar. Students who attend all sessions and successfully complete assigned exercises will be given a certificate of completion and validation of the seminar on their Co-Curricular Record. The deadline to register for all seminars is Wednesday at 12:00 AM (Midnight) of Week 1 of each quarter. CSI – Communication & Leadership and additional CSI Staff Members provide quarterly dialogue programs throughout the school year to engage in civil and meaningful discussions to learn about various perspectives on a range of topics. Coordinated by the Center for Student Involvement – Community Service staff, this seminar teaches students how to take action to solve local and global challenges. Doing Good Better supports students in carrying out their social innovation projects from idea through implementation. Gain awareness of their social identities and group memberships. Explain how socialization has impacted their identities, actions, and decision-making. Understand the various levels of privilege, power, and oppression. Identify practices to implement as an equity-minded leader. Learn about how they can further develop talents into strengths. Interfaith Dialogue workshops are held once per quarter students to share their journey of spirituality, faith, and religion; learn from differences, and discover commonalities. Students from all faith and non-faith backgrounds are invited to participate. Come prepared to learn from others, ask questions, and honor our shared humanity. CSI and the National Conflict Resolution Center (NCRC) are proud to announce Tritons Together: Campus Conversations, a new campus-wide program to offer community building dialogue circles for the UC San Diego community. A team of undergraduate student Dialogue Ambassadors co-facilitate Circle Dialogues, known as community building circles. Co-facilitators provide a structured environment to generate dialogue among participants on a specific topic. Circle Dialogues foster open and supportive spaces for people to talk across differences, develop empathy and enhance perspectives. 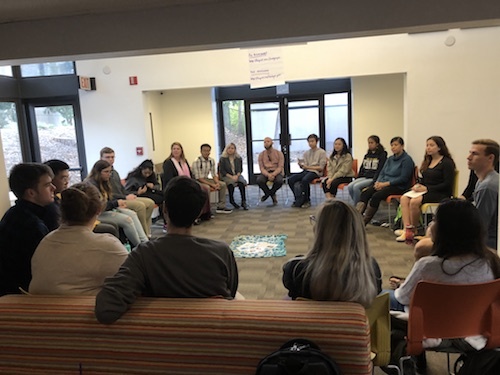 Campus partners & student organizations can request a community building circle, focused on a topic of their choosing by clicking here or contact dialogue@ucsd.edu.